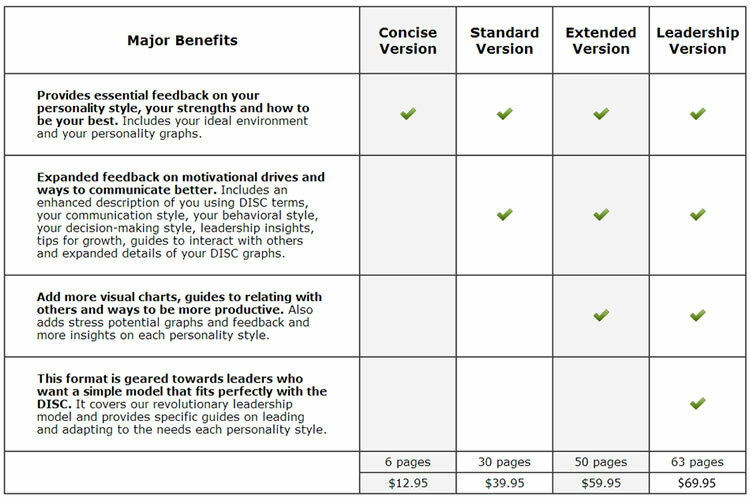 Human Capital Report is distinguished from other DISC personality profiles available on the market by offering positive and personalized feedback. Our approach is to offer reports that are both positive and practical. Therefore, we have invested heavily into our report processor system. Our content database is very extensive and has required many years to develop. Thus, our focus has not been to have the lowest price products. Our focus has been to offer the best personality reports with the highest value. Feel free to use this graphic image to help your users decide which version is right for them. You can click on the image below and chose (save as) or (save image as) to save it to your local computer. WHAT MAKES A HUMAN CAPITAL REPORT UNIQUE FROM OTHER DISC-BASED PERSONALITY PROFILES?